[caption id="" align="aligncenter" width="683"] Click for a bigger version! :)[/caption] I think this is about as far as I'll go with my bicycle design project. 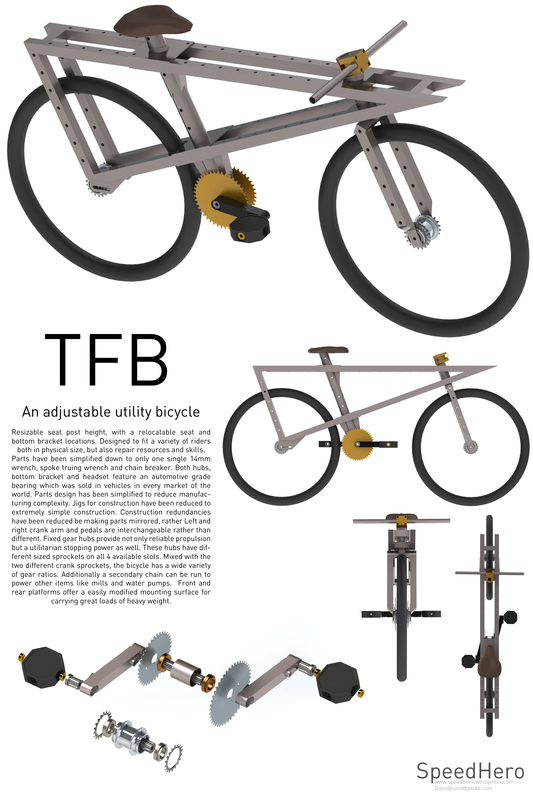 For those that don't know, I was hired by a company many years ago to design a bicycle for use in developing countries. After proving to them that buying $15 bicycles direct form China was actually the most cost effective and strangely enough, most environmentally sound method, they obvious chose that route. However, in my brain existed a few ideas that I had needed to express from this initial proposal. 11 years (?) later I decided to sit down and draw them out. Many of these ideas are things that were conjured separately, but were compressed into a single piece. In no means do I deem this perfect. Rather the inverse is the true reality. I've put a ton of time into designing it and it's so imperfect I'm tired of it it. It does show case some of these ideas but, in an un-elegant way. The intent of the cycle is to mobilize a wide variety of people for a great number of uses. Primarily transporting heavy loads. For this reason, it's an entirely adjustable bicycle. Not only does the seat raise in height, but it and the bottom bracket actually move fore and aft on the frame as well. This allows customization through simple bolts to fit many different riders, or only one as they grow and change. The frame features a dual triangle layout which dramatically reduces Jig design. The frame can basically be built on a flat table with nearly no jig at all. Tubing is simple 1.25" square tubing. It is indeed a heavy bike. This dual top tube also offers a great mounting point in front and behind the driver for goods. With many mounting holes these areas can be customized to mount baskets, flat trays, and other items. They can also be used to affix a motor, or even convert it into a recumbent cycle if desired. The hubs themselves are identical front and rear to reduce manufacturing complexity, but more importantly offer variety in gear ratio. The braking system reliability has been increased by simplifying the system to a fixed gear hub. This hub can be used to propel, but also slow the movement of the bike. Additionally, these hubs feature a different sized sprocket on every available slot. Meaning simply flipping the wheel and resizing the chain will result in a different gear ratio to fit the riders need. Most importantly, a secondary chain can be run from the unused cog, to propel some other piece of equipment, like a saw, water pump, mill, generator, or otherwise. Simplicity in construction was the aim, both to reduce repair complexity, but initial build costs as well. Both front, rear and bottom bracket axles/spindles are made from the same splined stock. They all share the same automotive grade bearing including the headset. This bearing is found in every market of the world and is specifically over sized for heavy duty work. Pedals and their corresponding crank arms have also been simplified to be interchangeable left and right. Further reducing manufacturing costs and simplifying repair. The entire bicycle can be constructed using only a 14mm wrench, a chain breaker and a spoke truing wrench. I am posting this, as it's probably as far as I'll take this idea. There is much I am unsatisfied with, but I've exhausted my attention to it for now.